Christian Silkstone played surely the most remarkable innings in Halifax League history yesterday. The Triangle captain came in at number three at home to likely Premier Division champions Thornton and hit 316 in his side’s total of 433 all out. The sweet-timing Silkstone hit 34 sixes and the perfect six sixes off one over from the luckless Ross Parr. While there have been a few individual scores in the low 200s, it is believed to be the highest Halifax League score in the top flight by some margin. Silkstone had another reason to celebrate. He moved on to 1,397 league runs for the season and that is a record for the Premier, overtaking Reece Jennison’s 1,216 for Blackley in 2009. Southowram’s Fiaz Haider did manage 1739 runs for Southowram in 2003 but that was in Section B. The defeat seems unlikely to stop Thornton finishing as champions. 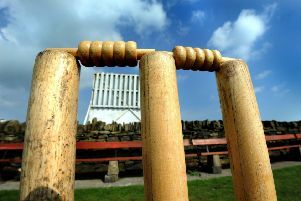 In spite of their mauling at the hands of Silkstone, they picked up maximum bonus points for bowling out Triangle in 42 overs and then replying with 286, even though it was 30 short of Silkstone’s tally.